Western Sahara with its capital is located in Africa (Northern Africa, bordering the North Atlantic Ocean). It covers some 266,001 square kilometers (about the size of Colorado) with a population of 603,253. Arabic is the official language spoken by people in Western Sahara. Algeria, Mauritania and Morocco are bordering countries. Western Sahara is an area in North Africa bordering the Atlantic Ocean, between Mauritania and Morocco. Western Sahara depends on pastoral nomadism, fishing, and phosphate mining as the principal sources of income for the population. Mostly low, flat desert, with large areas of rocky or sandy surfaces rising to small mountains in south and northeast. Low-lying sand dunes cover the territory. 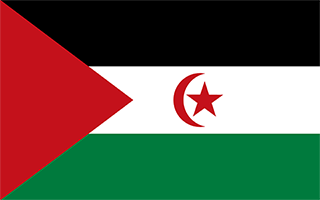 To reach someone Western Sahara dial +212 prior to a number. The local cellular networks are operated on 900 MHz, 3G. Websites typically end with the top level domain ".eh". If you want to bring electric appliances (e.g. battery chaarger), keep in min the local . The sign for the locally used currency Dirham is MAD.